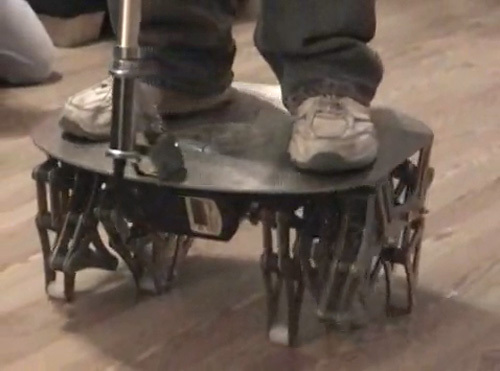 Cajun Crawler Is A Walking Segway | OhGizmo! From what I’ve seen, the large wheels on the Segway are capable of maneuvering over most terrain, but there’s clearly a reason why humans have legs and feet instead of wheels. So a bunch of students from the University of Louisiana decided to build their own Segway, called the Cajun Crawler, that uses a bunch of short legs underneath the platform to move about. While I wouldn’t necessarily call it fast, in the video below the Cajun Crawler does move a lot quicker than I thought it would. And if the walking mechanism used by those legs seems familiar, it’s because the Cajun Crawler was actually inspired by Theo Jansen’s kinetic walking sculpture that wanders the beaches of Holland. Hey Andrew, thanks for sharing this, keep posts like this one coming, I just love visiting your blog. Was this made by the same guys who made Cajun Bot for the Darpa Challenge?